Record levels of happiness have been recorded in normal people around the globe eagerly awaiting the deaths of the world’s five most hated men. 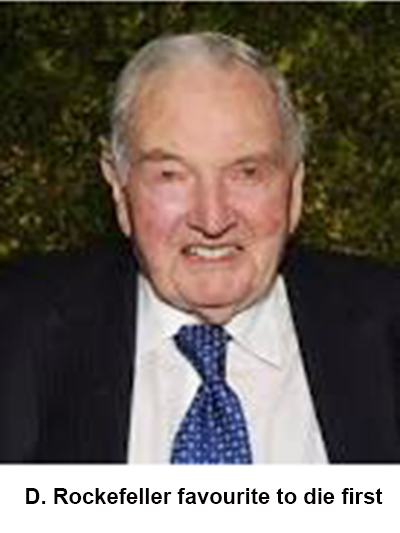 David Rockefella 99, is tipped as favourite to die first at 2:1, with Prince Phillip 93 and Henry Kissinger 91, joint second favourites both at 4:1 and George Bush Senior 90, along with Jacob Rothschild 78; rank outsiders. The views of Mr Senna and Rolano and those of Mrs Lego are thought to be widely shared by all sane people everywhere around the world and international interest for the exciting ‘Race of Certain Death,’ continues to gather pace. This entry was posted on 20 August, 2015 in homepage and tagged current affairs, Ethan Harrison, politics, satire, Social commentary. Bookmark the permalink.